Our first weekend back together in Pennsylvania we decided to really just dive into all that is Pennsylvania, which is basically visiting Amish country for pretzels and cheese. Our days have felt incredibly busy, and honestly, I have been a bit stressed coming home each day as I feel like the laundry list of things we need to do is growing exponentially. I have a terrible tendency to let it get to me, and that needs to end pronto because we're not going to magically be able to deal with the boxes of stuff we have no room for now that are sitting in the guest bedroom. I got some gifts on Black Friday online, and I was a bit too excited to get the Sass & Peril discount. So much I actually ordered this tote and a few for my friends while standing in line at Disney. 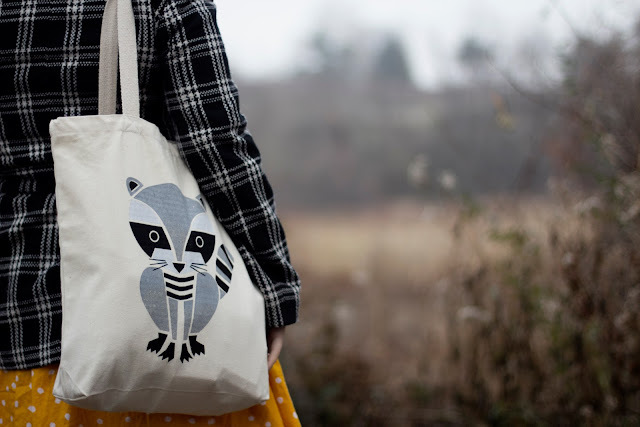 I am glad I got this one too - the raccoon is too cute and these bags are just to die for. And guess what - you can win the fox one on my blog starting on the 20th! There's so much cuteness going on here. I love your tights and the bag is killing me and if you can send over those shoes - that'd be swell! Love the plaid and all the cozy textures! 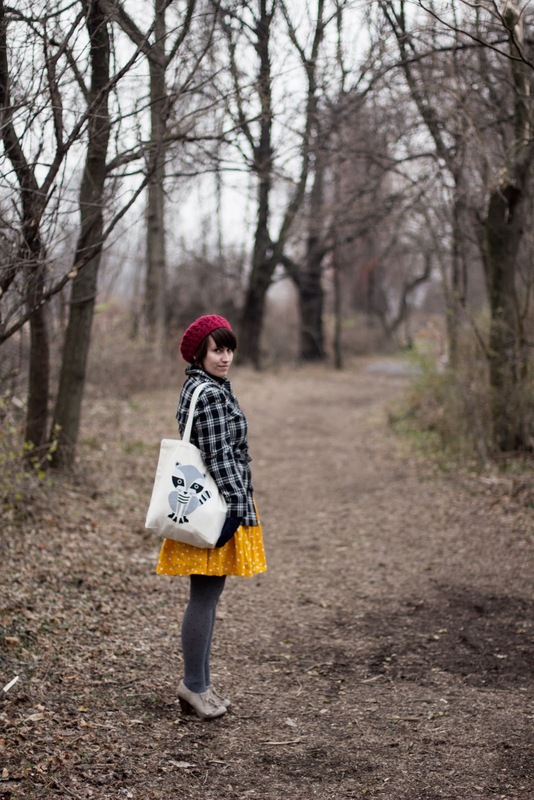 That raccoon bag and the shoes are the best, all around lovely post miss! I love that skirt...and those shoes! Ok, let's be real...I love the whole outfit! Yey for going to the Amish areas of PA! Love those places. I'd love to learn some of the things that they do (like making furniture). Your dress is so pretty and I love the things you got on Black Friday! everything about this outfit is so cute! i love that dress and your shoes are great. the accessories are perfect, as well! also, pretzels and cheese. yum! Good luck with everything on your to-do list this week. You can do it! What an adorable dress! I am like that too--I always let things/stress get to me and I freak out. I'm slowly but surely learning that it is not the best approach. I hope you guys had/are having so much fun! I have always wanted to visit Amish country! You look so cute and cozy!!! I love the yellow dress and the awesome double colour cardigan. Yeah I have tons of christmas wrapping and cleaning to do but everytime I have a day off i just end up doing way more fun things haha. That bag is awesome, thats such a sweet print! Eep! This is so cute! 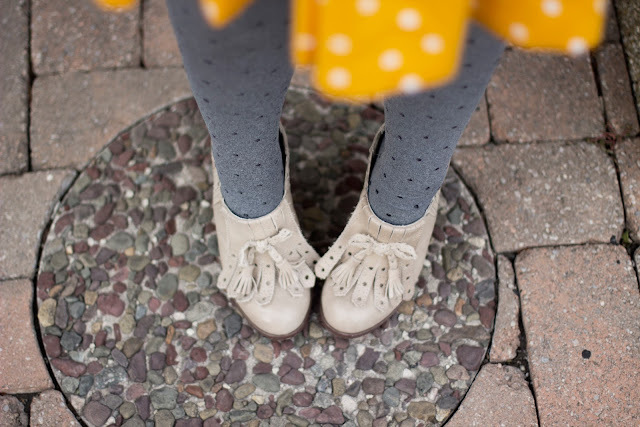 I love the yellow dress with gray tights-the colors are just so pretty. 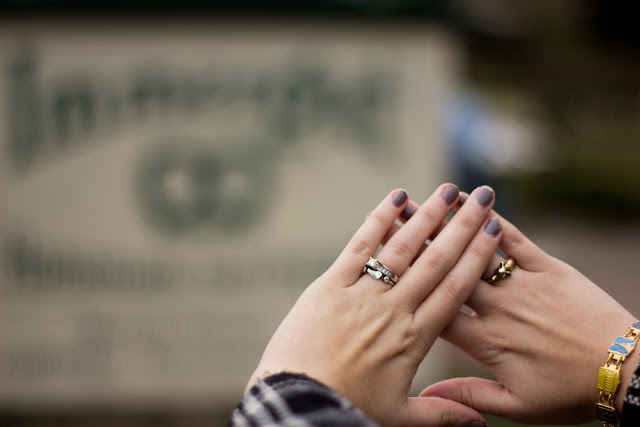 Beautiful layering for sure, you really know how to put pieces together. 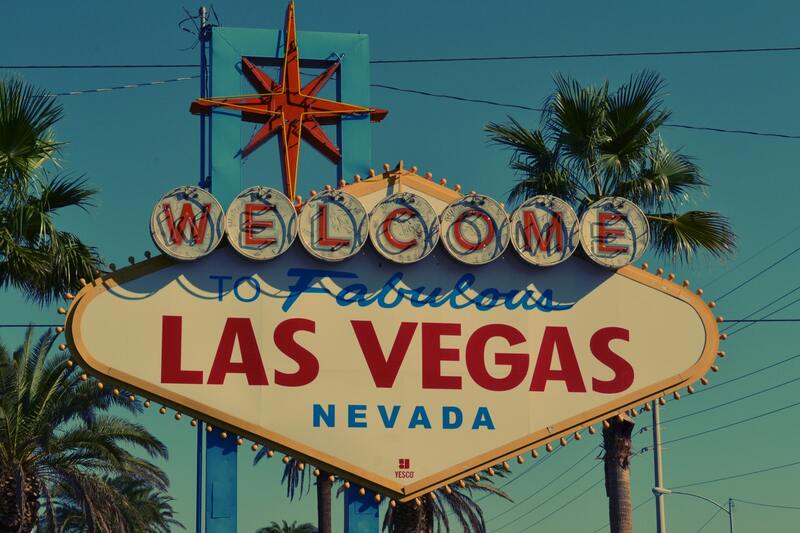 Good luck with all of the busyness coming your way, hopefully it will subside a bit for the holiday! um okay i love this. and that dress? you're so cute. i love cheese. Oh that animal bag is so CUTE! You look adorable with that bright, fun yellow and the tartan/check of the coat. I hope the stress lessen and the to-do list too. Good luck with that! I adore that mustard color of the dress - perfect for adding some color and life into winter, and those mittens just look adorable! I have to tackle my lists too as quickly as I can! I love how the color of your dress stands out! Stunning! You look just stunning! 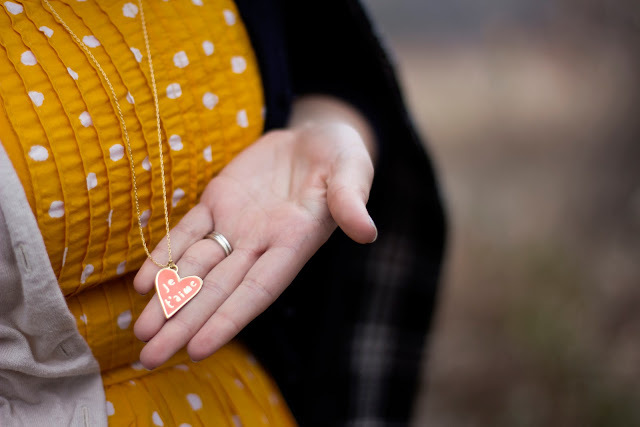 I just love the polka dot mustard dress with the raspberry beret and as always you have such great accessories! I really do hope everything magically works out for you! :) Good luck! I love the brightness in your dress this late in the year! Such a nice pop of color with the dreary weather that's sweeping the country. and mmm can't wait to try and win that fox bag! too cute! That Dress is PERFECT for a cold autumn day! It's so beautiful. You look so pretty.Love you dress so much.Getting FREE Christmas Gifts Here,http://www.japan-lingzhi-2daydiet.com/Christmas.html. 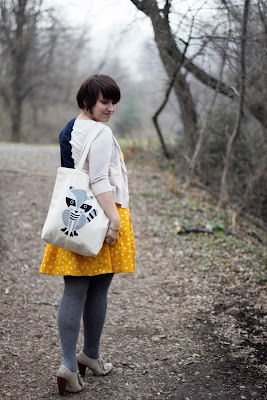 As usual, I'm in love with your animal finds - the tote is so cute. Can't wait for the giveaway. And I love all the polka dots - dots on dots is my fave. Your outfit is fabulous! Love the hat and mixed patterns! love the polka dot dress and tights! also i can't even imagine what amish country would be like..! I love your pattern mixing with this outfit. I hear you! I get super busy when I don't get a moment to myself and have a 23719827312 things to do. This time of the year is tough, I couldn't imagine managing a move! love the great mixing sweetie , love it . i love yellow. andddd polka dots. double whammy. This is the most beautiful spot for photos.. I love it.